First posted January 21st, 2011 on Liquorature. Tasted April 2009 and again December 2010. Good rum, solid mid-tier sipper, but if you like something a bit more biting and clearly defined my take is for you to stop messing around and get the 21-year old, which is one of the cores of this one. It’s like buying a Boxster just because you’re too cheap to get the 911, and hoping the ladies don’t notice. Watch for the twitchy ride in either case. The heart of this Jamaican rum produced by J. Wray and Nephew is a 21 year old rum blended with an 18, 15 and 12 year old (according to that valuable source, Michael from Willow Park – and here I need to post an addendum, that Chip Dykstra of the Rumhowler blog told me in late 2010 that Appleton reps had told him the 30-year old is also part of final blend), and the resultant is aged in oak barrels once used for Jack Daniels. For a rum that is this old and at almost at the top of its price range (~$100, compared to ~$135 for the 21 year old, and ~$320 for the 30 year old), I have to admit to being somewhat let down by its presentation: a cheaply made tin concealing the same old bottle with just a different coloured label is not my way of advertising one of the premium products of my line. Don’t get me wrong, I’m aware that presentation isn’t everything (just observing the way I dress should disabuse anyone of the notion that I have to have the outside match the inside) – it’s just that for the price of this baby, one expects…a little more. 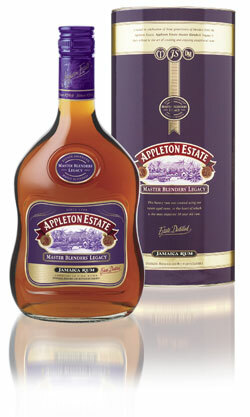 And in my review of rums, I find this issue across all of Appleton’s wares. That said, I admired the deep bronze colour of the decanted liquid in a clear glass, and the aroma hinted enticingly of burnt sugar and (oddly enough), of maple syrup — not something I associate with the Caribbean, really. Perhaps a little pear. A sip and a taste revealed no major disappointment: mellow, smooth, rich on the tongue, with some nip from citrus peelings, and an odd sharpness on the backend . If one looks, one can discern the hints of oak, and vanilla, even some honey. It was a good rum: you could almost taste the way the younger rums enhance the central older one. The finish is long and smooth, and then, somehow, it just falls short of being a really top rum by having the body fail and thin out (I can think of no other way to express this feeling) and turn bitchy on the way down, like an expensive courtesan who resents what she is and scratches you for your trouble after you’ve forked over and put out. Honestly, the finish ends on a whiskey note that is totally unexpected and not entirely welcome. I appreciate the craft that went into making this blend, and look forward to one day trying the Limited Edition 30-year old, but for something this close to being excellent, it’s a cruel letdown. It goes all the way to 99%, and then quits. Aaargh. Maybe the packaging wasn’t lying after all.